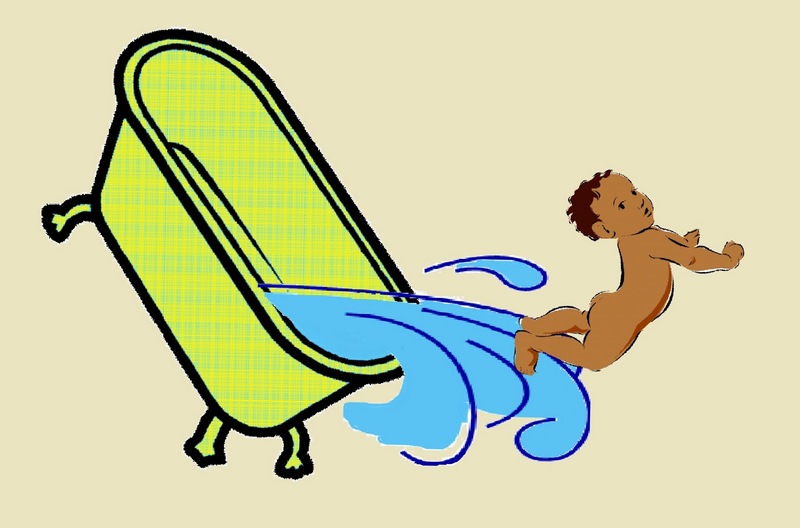 A 16th century idiom “throwing the baby out with the bath water” leaps up in front of me ever so visually during my interactions with people these days. Whether it is nuclear power generation or capital punishment or religion, I wonder why entire concepts are considered flawed because they did not work sometimes. A number of media-hyped failures or mistakes lead to wholesale rejection of an idea or solution. People do not bother to see the whole as composed of parts and to see which part has failed. Puerile, uninformed discussions are held at meetings in the real and virtual space without considering all the facts. The water sector has been much splashed with discarded “bath water” along with “babies”. Big dams top the list. Constant drumming by well-organised, rich NGOs has deluded a large number of well-meaning people into thinking that big dams always mean disaster. It is hardly understood that a proper strategy should put all options on the table – big dams, small dams, rainwater harvesting, wastewater reuse, water conservation, non-revenue water management, desalination. But blind opposition to big dams never goes out of fashion. In today’s world of complex water problems, an array of solutions are often required simultaneously right from leakage reduction to dams. A city with ten million people in Asia may not be well-served by just rainwater harvesting and small dams. Instead of focussing the discourse on how to design and construct dams where they are needed while avoiding the mistakes of the past, how to recycle wastewater or how to harvest rainwater so as to maximise benefits and lower costs, we see emotional, ideological debates. Ironically, the people who suffer most from delayed or cancelled dam projects are often the farmers waiting to irrigate their crops and women who have to wait at dried-up taps. A similar outcry against private sector participation in water supply and distribution is putting many good projects in jeopardy. Activists do not explain the context of failed privatisation projects and avoid talking about the successes of public-private partnerships (PPPs). Poorly designed contracts, improper risk-allocation and poor management are equated with a failure of the concept of PPP itself. Why do the real issues such as using PPPs to improve the capacity of public water utilities or tailoring PPP contracts to suit the needs of a city never form the subject of a debate? The biggest lie propagated by activists is that PPPs are responsible for inflated water tariffs. What is not highlighted is that public utilities which are unable to recover their costs from tariffs become slaves at the hands of their masters in governments. These masters who sanction funds for the utility also interfere in its functioning. Making utilities autonomous, allowing them to recover their costs from tariffs so that they can run their business in a transparent manner is a much-desired proposition that has never been communicated to people. Unless people internalise the habit of critical thinking and intelligent evaluation, there might not even be enough water to bathe in, let alone throw the bathwater. People fail to get one simple point, it takes huge cost for water to be available non stop at our home. And unless fund is generated, the cost might be met, but services provided at later stages won’t be possible. With proper subsidy for different section of people, privatisation can possibly be a better option. Govt agencies have shown how well they manage in these past many decades. Time to give this option a try. Good to hear some sensible views, Bhaskar. Water is the most vexed issue in this world. Privatisation will merely diviside the world into haves and have nots. Since this commodity is the lifeline of humainity , every human being has the right to access it without much diffiuculty, rather than its commercialisation. Privatisation is no answer. Hi Tanushree, you have to look deeper. There are several models of private sector participation in the water sector and they can be used effectively for equitable distribution of water. When well-designed, PPP contracts can actually help to uphold the human right to water. The first water storage reservoir was built – off stream – a few miles east of Haifa. By 1980 there were at least 500 such reservoirs in Israel. Most of these reservoirs store part of the runoff from the local watershed during the rainy season for use in the dry summer for irrigation. More recently some of the reservoirs store treated sewage (Tertiary treatment) for irrigation of most crops (root crops are not allowed in these project area. Most of the reservoirs are operated by water companies, where the users are owners. In 1970 we lined a reservoir with PVC and a layer of earth to prevent leakage. More recently we have advanced to an HDPE layer 1.5 mm thick, a must for recycled water. I would estimate that these reservoirs now supply close to 50% of irrigation water in Israel. Many of the engineering ideas and designs were based on similar small scale projects in the USA. I personally have seen many projects in the irrigated west and got basic information which was the basis for adjustments to fit local conditions. Our idea was to observe, study, make some changes that fit local conditions, run a pilot project and then expand learning all the time. When the agricultural community unites, sets up a water company for a certain area, and is the power behind entire projects a lot can be done. The water originally developed for irrigation was diverted to potable water uses and some of the money that would have been necessary to increase potable water was used to build part of the infra structure needed to use reclaimed water. There\s more than one way to “skin a cat”. Yes, Israel is quite well-known for its water reuse measures apart from drip irrigation.I am not quite sure about how well it is handling the water-energy nexus but it’s water management is indeed commendable.